Stepping off of Kuala Lumpur’s subway train onto the platform at Cheras station felt as routine as my once-daily commute through the Washington, DC Metro system. In my research team’s efforts to understand where and how the majority of Kuala Lumpur residents lived, we had to leave the traffic-clogged streets of downtown and make our way out to a vast landscape of banal high-rise towers. Tucked between the twenty-story monoliths was Cheras, a sprawling community of garden-style public housing units slated for demolition as luxury residential development pressure finally leaked into the peripheral suburbs. At first glance, the complex seemed just a little worse for the wear. Rigged clotheslines stretched across upper-story windows and a series of pocket parks and winding paths offered a quality of landscape and play that’s often painfully absent in public housing. Surprisingly, Cheras was actually mixed-use; low, one-story rectangular buildings punctured the site with potential small commercial storefronts. 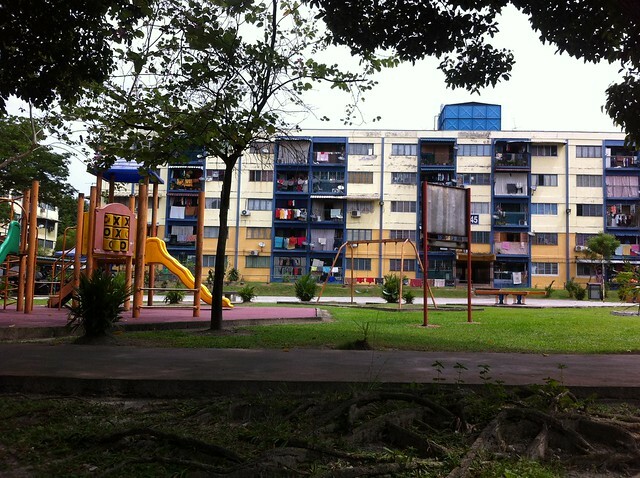 On the day of our visit though, despite being a holiday, few people lingered in the complex’s common areas. Only two of the storefronts were actually occupied. 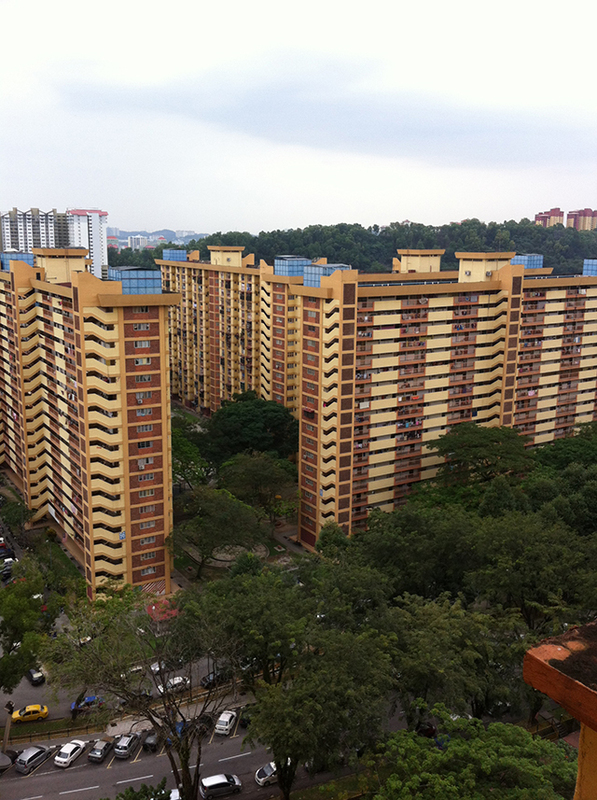 Cheras seemed like a place that represented the ideals of social housing urban design in its heyday but had since aged, quieted down, and settled into a rhythm that seemed as isolated from the neighborhood fabric around it as any other modern tower. Perhaps the greatest asset our team brought to Cheras was the multiplicity of languages spoken by the students at the University Teknologi Malaysia (UTM). With their help, our group engaged with Chinese, Indian, and Malay residents at Cheras, who we found as we slowly walked the site, looking for hints of life. A small crowd of boys played outside one of the two storefronts, attracting pigeons with breadcrumbs. A group of gossiping Chinese housewives gathered in the second storefront, seated around a table, eyeing us cautiously. Only when a team member speaking Chinese approached did their eyes brighten and an invitation extended to join. To our great fortune, the resident head of the complex representing the interests of Cheras’s Indian population happened to be out and was willing to talk to us. From him, deeper issues not immediately apparent by our own empirical observations became clear. Children being electrocuted by exposed wires due to faulty maintenance. Dengue fever spreading thanks to mosquitos attracted to sitting water not properly drained. Factions arising between the community’s various ethnic groups, despite the Malaysian government’s constant assertions that the country had few if any issues with ethnic tension. And, perhaps worst of all, the potent belief among residents that because the community overwhelmingly voted for the opposition party, the government was lashing back by deferring maintenance and drawing up plans to tear the whole place down. Our mission in Kuala Lumpur, and within the MIT-UTM Malaysia Sustainable Cities Practicum as a whole, was to seek out ways in which Malaysia can be a model to developing countries in sustainable development and managed growth. One of the greatest questions facing these countries is simply how to provide adequate, equitable housing to an exponentially increasing population. Though government officials touted a “zero squatter population” statistic to us with pride and claimed to have a housing unit for every citizen, the reality of Kuala Lumpur’s development patterns raised questions and concerns. Throughout the week in Kuala Lumpur, we constantly sought to compare the government’s official statements with the lived experience of residents like those in Cheras. What arose from a week of site visits and interviews was a complex, often contradictory impression of a city yearning for and on the cusp of real global impact, but forced to confront what that means for the residents who already call Kuala Lumpur home.